Sophisticated in design, this elegant sleigh headboard is the perfect fit in any child's bedroom. 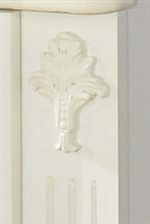 It features simple a white luminous finish to brighten up the bedroom as well as classic shaped molding details. Watch your daughter sleep like a princess with this fairy tale sleigh headboard. A bedframe is required (sold separately). This headboard is available in twin and full sizes. The Exquisite Full Sleigh Headboard by Signature Design by Ashley from Nashco Furniture - Nashville. We proudly serve the Nashville, Franklin, Brentwood, Clarksville, Green Hills, Davidson County, Williamson County, Tennessee area. Product availability may vary. Contact us for the most current availability on this product. The Exquisite collection is a great option if you are looking for Glam Traditional furniture in the Nashville, Franklin, Brentwood, Clarksville, Green Hills, Davidson County, Williamson County, Tennessee area. Browse other items in the Exquisite collection from Nashco Furniture - Nashville in the Nashville, Franklin, Brentwood, Clarksville, Green Hills, Davidson County, Williamson County, Tennessee area.